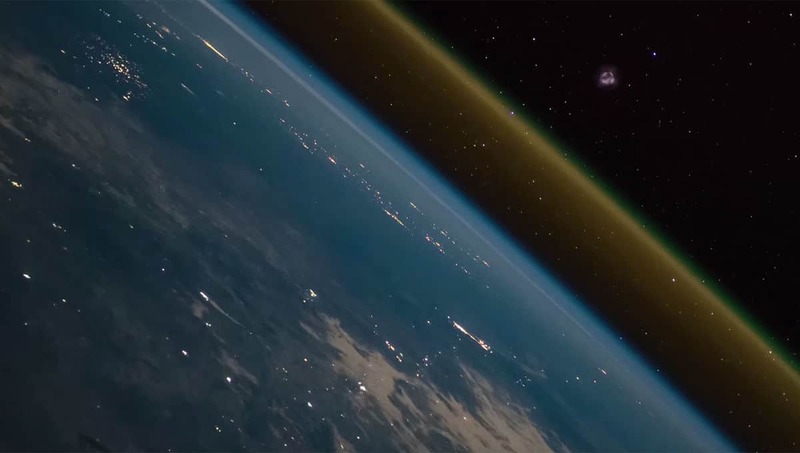 Home » AMAZING TIME-LAPSE VIDEO OF A ROCKET LAUNCH… SEEN FROM SPACE! Yesterday, I showed you a video taken by an astronaut aboard the International Space Station, showing the Earth below over two complete ISS orbits. There was a lot to see, including familiar and unfamiliar landmarks, weird atmospheric phenomena, and even thunderstorms seen from above. That video had a lot of cool stuff, but now I have one that’s even better. Way, way better. On November 16, 2018, a Soyuz-FG rocket launched from Kazakhstan, and perched atop it was a Progress resupply ship carrying two and a half tons of materials for the astronauts on ISS. The launch occurred at 18:14 UTC, or just after midnight local time. As it happens the ISS was over the Russian/Mongolian border at that time, far to the east of the launch but high enough above the Earth’s surface to still see it directly. Astronaut Alexander Gerst set up the camera facing west for all this. In a typical launch of this type of rocket, the first stage consists of a core booster plus four side boosters, and the side boosters are dropped about two minutes in. The core continues burning for just under three more minutes before it cuts off, is dropped, and the third stage ignites, burning for several minutes as well to place the Progress into orbit. The plume of the rocket is visible as it climbs into the atmosphere starting about 5 seconds into the video. I tried several times but I can’t convince myself I can see the side boosters drop (there’s a flash of light about 7 seconds in that might the ejection charges for the side boosters; that’s about the right timing). At 23 seconds or so there’s a burst of light and a huge puff of vapor; that’s the second stage dropping off and the third stage igniting. The exhaust looks different because engines designed to work in a vacuum are different from those that work in air; the higher pressure of air at lower altitudes constrains the exhaust plume while in a vacuum the plume can expand more freely. Engine nozzles for an upper stage are generally shaped differently to provide more efficient thrust despite the change in pressure. Mind you, even as the third stage continues to burn and accelerate the payload (the Progress cargo ship) up into orbit, the second stage is on a ballistic path. It built up a lot of momentum, so it’s still arcing up and away from Earth… but slowing due to Earth’s gravity. Like a rock thrown in the air, eventually it reaches the top of that arc and starts to fall back down. It plows downward through the ever-increasingly thick air, creating a lot of pressure in front of it. When you compress a gas it heats up, and eventually the compression is so violent that that air heats up enough to start vaporizing the booster. It glows, and you can see that about 45 seconds into the video! It leaves behind a vapor trail, and flashes of light indicate smaller pieces of the booster falling off and burning rapidly. This is how a meteor works, in fact, though bits of interplanetary detritus coming from space move much faster than a rocket re-entering. Finally, a little after a minute in, you can see the Progress ship as a bright dot; I believe it becomes visible after it deploys its solar arrays, which have a span of about 10 meters tip-to-tip. Two days after launch (not in this video, obviously), the resupply ship successfully docked with ISS. This is no routine flight, either: It was the same type of rocket that failed on October 11 when it was carrying two crew (cosmonaut Aleksey Ovchinin and astronaut Nick Hague) when one of the side boosters didn’t drop off correctly, colliding with the core booster. Happily, the crew was able to abort safely and land back on Earth, but the mission was lost. So the good news here is that the successful launch of the uncrewed Progress vehicle clears the way for the two men to be sent to ISS, probably in early 2019. This all comes on the heels of news that both SpaceX and Boeing have scheduled test demo flights for their crewed missions, for January and March 2019 respectively! Operational missions — meaning sending human beings up to ISS — should start in late summer 2019. It’s a new era in spaceflight. I’m very glad to see it coming.